With the EVERLINE® family of Emergency Drivers from Universal Lighting Technologies, no additional modules or fixtures are needed to meet emergency lighting requirements. These emergency drivers can be installed inside or on top of a fixture to operate one fixture during a power failure. When normal power fails, the EVERLINE Emergency LED Drivers sense the loss and immediately switch into emergency mode. This means the emergency lighting unit immediately begins supplying supplemental power to support emergency lighting operation for a minimum of 90 minutes. When normal power is restored, the emergency lighting unit returns to the charging mode. With the emergency driver and battery combined in a single unit, this driver can be installed in the field in minutes. 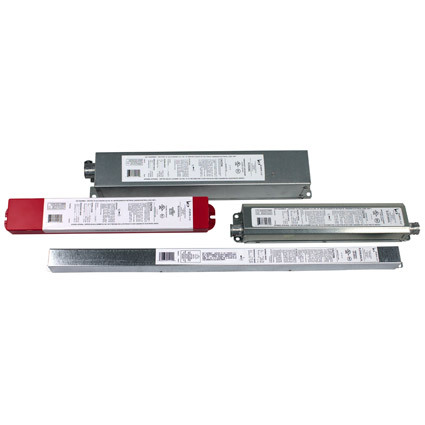 EVERLINE® Emergency LED Drivers allow LED fixtures to serve as code-compliant emergency lighting sources. These easy-to-install drivers are designed for indoor Class 2 use with general linear lighting, low profile architectural, high bay, and downlighting applications. Other Products by Universal Lighting Technologies, Inc.
Universal's EVERLINE® Professional Retrofit Kit simplifies the transition from fluorescent to LED. LED technology reduces electrical demand and energy consumption compared to conventional fluorescent lighting systems, and also offers controllability, light uniformity, and less maintenance. Universal's EVERLINE® Vapor Tight is ideal for unforgiving lighting environments. These durable LED fixtures have a fiber-glass reinforced housing which protects the light source and electronics from water, vapor and contaminates. The Douglas Lighting Controls® Bluetooth® Fixture Controller & Sensor (BT-FMS-A) provides automated individual and group control of light fixtures using onboard sensors and Bluetooth technology. The BT-FMS-A installs easily in compatible Universal EVERLINE® Luminaires to immediately provide bi-level occupancy control with no further configuration needed. The EVERLINE Professional Volumetric Luminaire (PLA) is a recessed volumetric LED Luminaire. Designed for the replacement market, the PLA series is easy to install, delivers even illumination and has a clean, modern appearance designed to visually match the Professional Retrofit Kit (PRK).